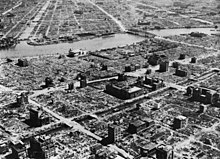 This Tokyo residential section was virtually destroyed after a massive firebombing raid by the U.S. Army Air Forces B-29s on March 9–10, 1945, the single most destructive raid in military aviation history. The bombing of Tokyo in World War II cut the city's industrial productivity in half. In military aviation, area bombardment (or area bombing) is a type of aerial bombardment that is targeted indiscriminately at a large area, such as a city block or an entire city. The term "area bombing" came into prominence during World War II. Area bombing is a form of strategic bombing. It can serve several intertwined purposes: to disrupt the production of military materiel, to disrupt lines of communications, to divert the enemy's industrial and military resources from the primary battlefield to air defence and infrastructure repair, and to demoralise the enemy's population (See terror bombing). 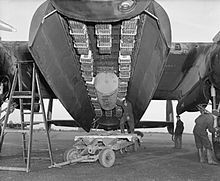 "Carpet bombing", also known as "saturation bombing", and "obliteration bombing", refers to a type of area bombing that aims to effect complete destruction of the target area by exploding bombs in every part of it. Area bombing is contrasted with precision bombing. The latter is directed at a selected target – not necessarily a small, and not necessarily a tactical target, as it could be an airfield or a factory – and it does not intend to inflict a widespread damage. ^ An early example of this use of "carpet bombing" is from 1942: Seemann, Berthold, ed. (1942). "The Journal of Botany, British and Foreign". Journal of Botany, British and Foreign. R. Hardwicke. 80: 80.